Today marked the beginning of my spring quarter. I’m only teaching one class, a survey of British Literature to 1688. I have 50 students and a T.A. to do most of the grading, so I can’t complain too much. I’ve only taught this class one before here at OU. That was the first time the course was offered here, so it was a much smaller class of only about 30 students. Because of the size, that time I was able to spend most of class time discussing the reading material rather than lecturing. It went well enough, but it wasn’t a class that I immediately wanted to teach again. This time, I’m pretty much going to have to lecture during the two lecture days and then let the T.A. meet with the two discussion sections on Fridays. This means the bulk of my work this time will be in preparing the lectures, something I don’t regularly do in my other classes. It will be interesting to see how this goes. One motivating factor will be that I’m teaching the class again next winter, but that time it will be one of two classes I’m teaching. If I work hard this time (i.e., if I write great lectures now), it will mean less work in the winter. 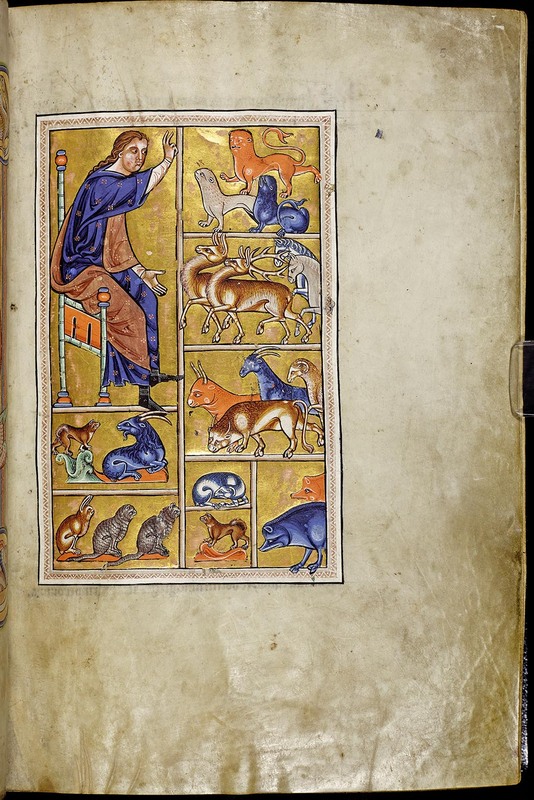 This image depicts Adam naming the animals. We talked a little about the way in which Adam is portrayed in this image — the fact that he’s clothed, that he resembles more familiar images of Christ, and the kinds of animals included in the naming. The point of our discussion of the image (and ultimately of Medieval literature) is the Christianization of pre-existing, non-Christian texts. We talked a little about the way in which this painting uses objects to represent Humanism and the pursuit of knowledge and how that contrasts to the memento mori of the skull. We also talked a little about perspective paintings. I wanted to get my students thinking a little about the ways in which this image could portray a Christian idea but (if it does) does so in a more subtle way than the Medieval image. I wanted to use this painting to talk about Restoration libertinism and satire. The projection wasn’t quite good enough for all of them to see the monkey clearly, so that was a little difficult to get across, but I think it worked ok.
As we went along, we talked about key concepts from each period, genres, authors, and dates. I just wanted to give them a start in thinking about the big picture stuff, so that as we go along I they will have already heard the words “Humanism,” “Medieval,” or “libertinism.” We’ll see if that helps. We start Old English literature on Thursday. We’re reading two short poems and some excerpts from The Anglo-Saxon Chronicle. I guess I’d better get busy on that lecture …. This is a very imaginative and useful way to start a class! Sounds like a very interesting lecture to me! 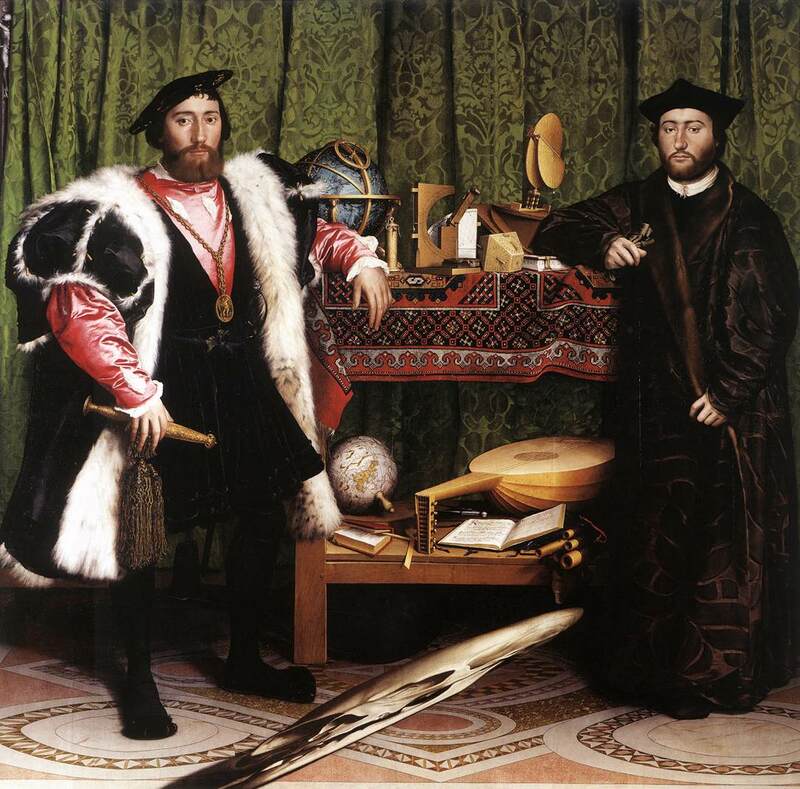 I love Holbein’s Ambassadors. I remember being freaked out by the crazy skull when I first saw this painting in an undergrad art history course.